The Rare Earth Elements (REE) are a series of 17 chemically similar metals, consisting of the 15 elements known as the lanthanides, plus yttrium and scandium. REE metals and oxides are of value due to their unique magnetic, chemical and luminescent properties. Throughout the industry REE are normally expressed in terms of rare earth oxides (REO) and often classified into three groups: Light, Medium and Heavy. 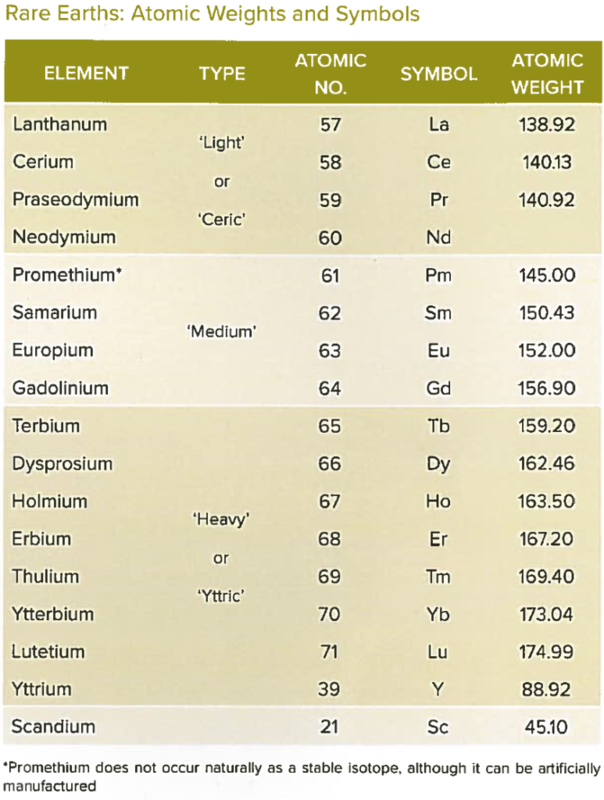 The rare earths with their atomic weights and symbols are shown in the table to the right – Table 01. REEs are critical minor constituents for many advanced materials that are essential inputs to the manufacture of items such as hybrid vehicles, mobile telephones, computers, televisions, energy efficient lights and mag-lev trains. Although rare earths have a relatively high unit value, the impact of their cost in most applications has little impact on the selling price of the final item. There are no effective substitutes for the REEs. Furthermore, as they are generally present in minute concentrations they are not often recycled. 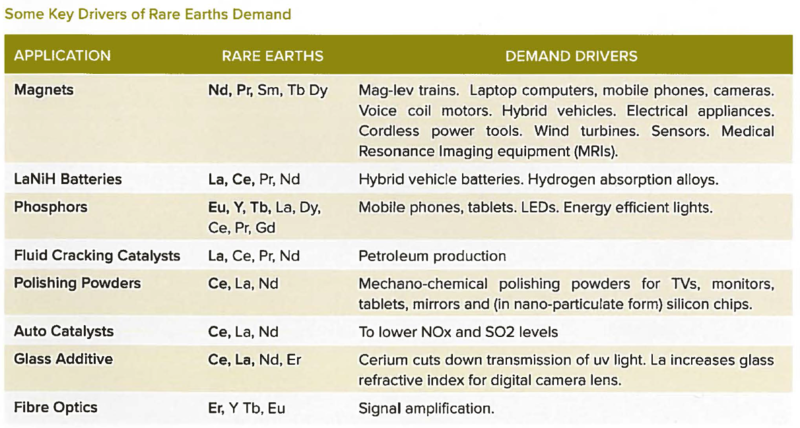 It is for these reasons that rare earths are considered critical materials. Some of the major applications for rare earths are given in table 02 below. Scandium (Sc) is the most effective strengthening additive for aluminum alloys. Although there a number of niche applications for Sc, there is currently limited demand because there is almost no sustainable supply and the cost is prohibitive. Future demand for REE for the coming Electric Vehicle (EV) revolution, holds the potential for large increases in REE demand as shown in table 04 below. 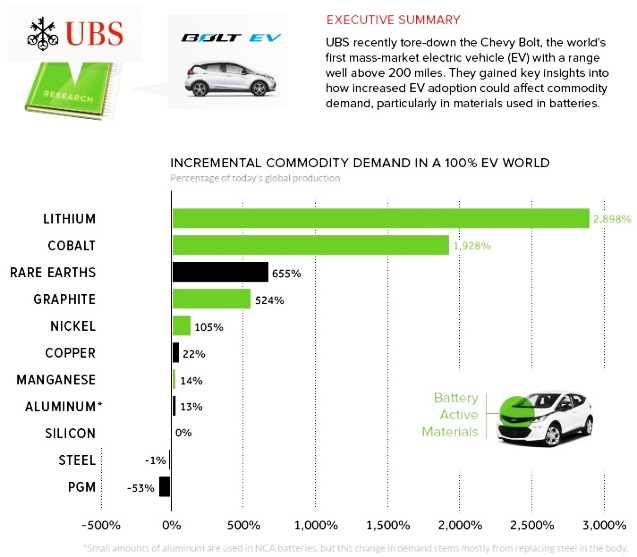 This potential increase in demand for REE’s is very large and exceeded only by the potential demand for Lithium and Cobalt necessary for EV batteries. Table 01 - “The Rare Earths Industry in 2016”, Professor Dudley J. Kingsnorth, Curtin Graduate School of Business, Industrial Minerals Company of Australia. Emerging applications for REE’s, including Sc, include Hydrogen Alloys, RE-Mg Alloys, and RE-Al Alloys. 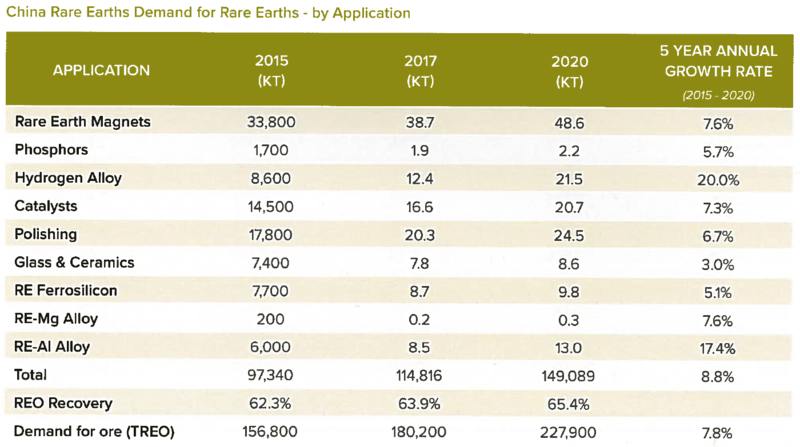 As shown in table 03 below, these new applications for REE’s are projected to have the highest growth rate for all REE’s. Table 02 - “The Rare Earths Industry in 2016”, Professor Dudley J. Kingsnorth, Curtin Graduate School of Business, Industrial Minerals Company of Australia. Table 03 - “The Rare Earths Industry in 2016”, Professor Dudley J. Kingsnorth, Curtin Graduate School of Business, Industrial Minerals Company of Australia.